Outlet Plug Me In had a website built in HTML and CSS. Kathleen, Founder and CEO, wanted a new website. 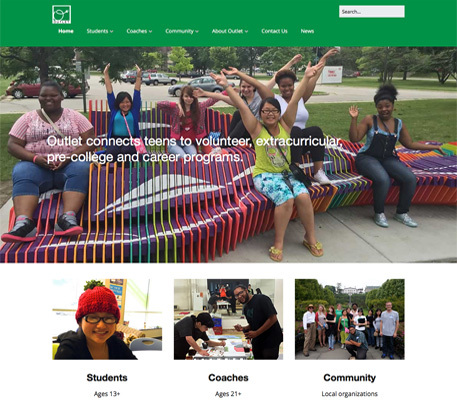 A website that was easy to update and helped students and organizations learn more about how Outlet could help them. Outlet's website was built by a team. Kathleen, Gloria and I plus two student volunteers. First, we decided to build the website using WordPress. WordPress would allow Kathleen to update her site quickly and easily. Next, Gloria suggested using a WordPress theme called Make. Gloria was familiar with this theme and had good results with it on another project. We divided up the website. Each person worked on different pages. Gloria handled additional items like SEO, Security and issues with a content loading slowly on a couple of pages. I added the forms, plugins for Google Login and FaceBook Updates and image optimization. We helped Kathleen with embedding charts and imfographics that she created using Google Docs and Piktochart. By embedding them, we help keep visitors on the website longer. Outlet Plug Me In takes photos to document and share its mission. We had photos of students and adult volunteers working on different projects and tasks that make Milwaukee better. We selected photos from Outlet's Flickr account and used Photoshop and SmushIt, a WordPress plugin, to optimize the photos. By optimizing the photos, we made the pages load fast. With a website that uses alot of photos, we wanted to make sure that they loaded fast. Outlet Plug Me In has a new website. A website that is easier to maintain and make changes to. We increased search engine results by updating the website with better SEO (search engine optimization).